This year’s annual Member & Maker Survey was the, to date, largest global effort to understand our community with 2.390 Impact Hub Members participating in the survey. After six months of joint preparation with academic partner the Vienna University of Economics & Business the survey was conducted between February and March 2016 asking Impact Hub Members key questions about their demographics, business progress and overall happiness in the community. In Zurich 151 Members took part in the survey. Now, the results are in! While we will discuss the key findings with our Members in depth at our next Townhall Meeting, here is already a peak into our community. 60% of our members are male and 40% female (this was 50/50 the year before). Most members belong to the age cohorts of 26-35 (44.7%) and 36-45 (35.6%). All members have a strong educational background and started their business with quite some year of work experience under their belt (on average 10.4 years). 85% stated that they are founders or co-founder of their company, and most see themselves as either enablers of impact or as creators of a direct imp act with their product or service. 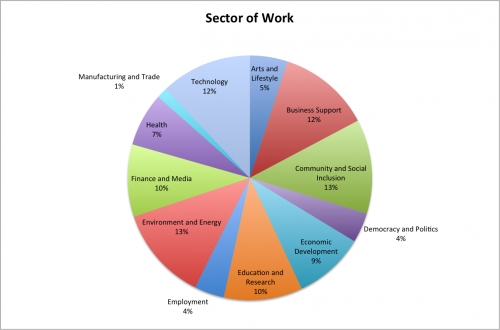 The areas of their impact could not be more diverse (as can be seen in the pie chart) with the most prominent areas being Tech, Environment & Energy, Business Support and Community & Social Inclusion. 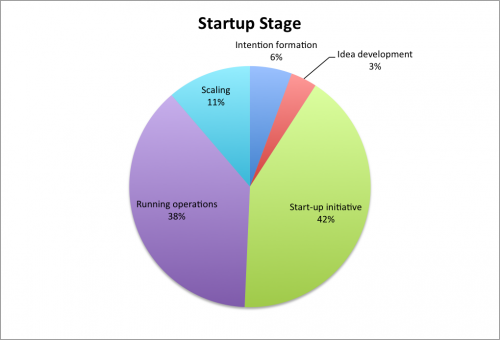 Most of our Members’ companies or projects are either in a start up phase or have running operations. 60% of companies were founded in the la st two years. 50% reported that their revenue (strongly) increased in the last year and for 48% it remained stable. 242 Jobs were created by our members in 2015. Furthermore, 80% reported that their impact is either foremost social or both social and environmental rather than having a foremost financial focus. 73% gave feedback and advice to other members, find it easy to approach other members and discuss their projects. 60% see this effort as mutual. 40% shared resources and 30% actually worked together on a project. In 2015 720 hours were spent providing support and over 4.000 valuable connections were made. When asked where most support is needed in 2016 access to clients, experts & financial were the top three answers with fundraising, legal advice & marketing and PR being the most needed professional services. Over 80% of Members were happy with our efforts in strengthening personal motivation, supporting them in collaborating with the right people and connecting them with advisors & experts. These needs were also rated amongst their most important needs in general. Only 23% were content in our support to obtain financial capital and generating revenue making this one of the most important areas for improvement. After receiving similar results in 2014 (34% satisfaction rate) we started Viaduct Ventures and we will continue to improve our efforts in getting our members access to the right investors and clients. If you have ideas, get in touch and/or join the next Town Hall Meeting on September 6th. *Of course this data does not include identifiers of the participants. All participants remain anonymous.